I Wear Pink Breast Cancer Awareness Teddy Bear - 8"
Pink Timothy Bear - 8"
Proudly display your pink on our, I Wear Pink Plush Breast Cancer Teddy Bear. Whether you are supporting your grandma, mom, aunts, sister or best friends, each Teddy Bear proudly displays who you support with love and compassion. This uplifting Pink Timothy Teddy Bear features embroidered eyes and mouth to make her safe for all ages. She is handmade, surface washable & measures 8" tall with a satin pink bow tied around her neck. Personalize the shirt for free by adding any title and name. Free Gift Wrapping and a Free Gift Card are also included to create a thoughtful presentation. Additional Details 800Bear.com has a growing collection of Awareness Plush Animals for all of your gift giving needs. 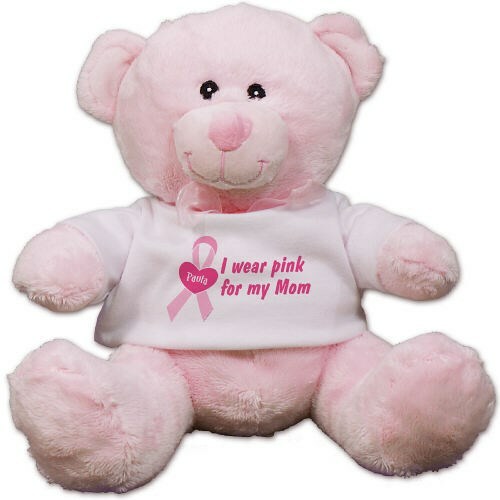 We also carry a exclusive Save the Boobies Breast Cancer Awareness Bear & a Pink Ribbon Teddy Bear as well.